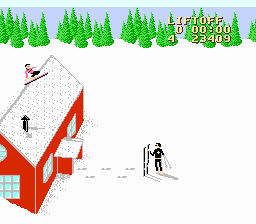 "A snowboarding game on the NES, you think it wouldn't be complicated, what with the goal involving going down hills." So what's your one hard game for the NES? That's a trick question: it's impossible to have only one pick. Every gamer that's gone through the system's dominance during the mid to late 1980s had their share of woes, as there was a high ratio of balls-of-steel releases due to high difficulty, steep learning curve, or just bad design. For me, there were certain games where I had such frustrating experiences, that I still remember them clearly to this day, while apparently having selective memory for others, with Heavy Shreddin' falling in the latter category. Before returning to this cart after nearly a decade and a half, I tried my best to conjure up past sessions. It was surprisingly tough, only recollecting two things, a half-pipe segment and the fact the game just infuriated me to the point of memory loss. Hilariously, after one playthrough, a chain reaction erupted in my head, images flooding back, and I thought, "Ohhhhhh, this." 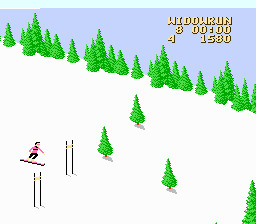 A snowboarding game on the NES, you think it wouldn't be complicated, what with the goal involving going down hills. That, and the grand assumption of it being simple and arcadey, since most releases for the console required next to no instructions to understand. This is where the annoyance starts for, and I say this with absolute confidence, every player that has a go with Heavy Shreddin' for the first time. You'll find yourself in constant turmoil, losing lives and being sent to the Game Over screen numerous times, where a reindeer gives you a cold stare. People will be able to navigate around most trees and jump over streams without much problem, but the troubles come when they encounter obstacles that push them into last-second reactions. They'll likely lose a life or two before getting some right, however other tasks ask for more specific executions to pass successfully, and that's going to be the breaking point for many. This is because they won't want to spend time returning to these spots on a limited set of lives, only to lose them all without knowing how to succeed. With your "death count" reaching abnormal heights, that fail tune quickly gets old and will cause you to lose your mind. If you're still trying to play the game after this point, you'll start to complain about little nuisances, like the kinda-isometric play field that makes weaving around trees and poles a little hard because of the hit detection. Then you'll moan about the slow movement of the board, lack of lives, no password or level select system, or how there's no continue option. By the time you finally give up on Heavy Shreddin', you'll just loathe it to death, which I'm sure kids playing it back then did, as well a new generation of gamers jumping in blind, eager to scorn the game in articles or use it as a comedic poking stick in video reviews. Considering the unflattering account given so far, I... actually kinda like Heavy Shreddin'. Though, not at first, since my relationship with the game was very rocky, to the point of abandoning it for years over games like Super Mario Bros. 3 and Kirby's Adventure. But then I gave it another chance during the PlayStation/Saturn/N64 era, as it felt like I was leaving things unresolved, like there was some element missing whenever I played it. Turns out there was. Now, as much as people today complain about in-game tutorials (I just hate ones you can't skip) and their habit of stating the obvious, at least the stuff is included at all for major convenience. What players seem to forget about "complex" games of yesteryear is their dependence on instruction manuals, and without their aide, a lot of these titles are next to impossible to understand and complete. Heavy Shreddin' happens to be one of these games, and by simply opening the manual, you get a shocking amount of information, from knowing how to perform stunts and gain additional lives, to not only having access to a list of obstacles you'll encounter, but how to survive each one. While this knowledge makes Heavy Shreddin' considerably more playable, stunningly, it's still a difficult game to finish. Due to the title's stance on a low-life count, you have to beat all six courses in one go, with minimal fails; it definitely earns the NES HARD seal of approval. 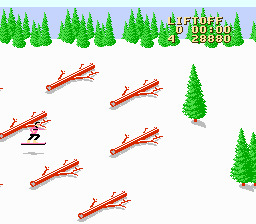 This actually gives the game an exciting adrenaline rush, because you're crossing a long tightrope of memorization; slalom sections demand precise turning since the gates are sometimes spaced in awkward locations, you'll need to finish timed downhill segments without slowing down at all, and the final area of each stage, the Backwood, force you through absurd situations, like jumping over various cliffs using proper tricks and hopping off the roof of cabins at the right angle. Of course, the closer you get to the end, the more heart pounding the ride gets, with the smallest mistake turning you into a wreck and ruining your mojo. 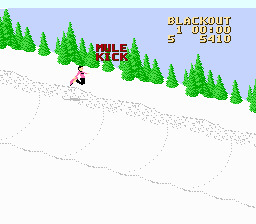 It also makes for some awesome comebacks, like when I mistimed a jump over crowded moguls, which made my board wobble frantically, doomed to a crash, but I saved myself at the last second with a mule kick stunt. Happened a few times, too, and I somehow managed to finish the segment before running out of time! Although I got a great sense of satisfaction when I concluded the last course and received a trophy, there was some disappointment that this was it. Not trying to undermine the content provided for you in the six courses, because there's a lot, but the material gets reused a ton. Albeit, they get used in clever, tricky patterns, however a bit more stuff would have made for a fleshed out and longer NES release. Looking at it from an oldschool point of view, however, Heavy Shreddin' loops, so you can test your endurance and turn this into a high score marathon. Though I'll admit, I'm stretching in convincing you that's solid replay value. Despite that qualm, I still think it's a nice game and believe it gets too much of a bad rap. Some are going to crucify me for saying this, but once you understand its play mechanics, there isn't much to separate Heavy Shreddin' from some of its modern day counterparts. If you enjoyed this Heavy Shreddin' review, you're encouraged to discuss it with the author and with other members of the site's community. If you don't already have an HonestGamers account, you can sign up for one in a snap. Thank you for reading! None of the material contained within this site may be reproduced in any conceivable fashion without permission from the author(s) of said material. This site is not sponsored or endorsed by Nintendo, Sega, Sony, Microsoft, or any other such party. Heavy Shreddin' is a registered trademark of its copyright holder. This site makes no claim to Heavy Shreddin', its characters, screenshots, artwork, music, or any intellectual property contained within. Opinions expressed on this site do not necessarily represent the opinion of site staff or sponsors. Staff and freelance reviews are typically written based on time spent with a retail review copy or review key for the game that is provided by its publisher.